A spy camera used in the Cold War by Soviet spies has sold for £29,000, despite having an estimate of only £80-£100. The camera, which was disguised as a packet of cigarettes, was part of a Russian collection which included an issuing slip from the KGB. The sale was an auction house record at Aston's Auctioneers in Dudley. Another camera disguised as an umbrella sold for £2,700, and one hidden behind a man's jacket button sold for £1,000. The cameras were part of a collection acquired by the owner during his travels to the Soviet Union during the 1970s and 80s. 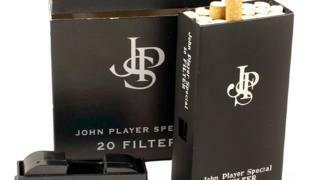 The disguised metal cigarette packet is fitted with a KIEV-30 sub-miniature camera and includes real Russian cigarettes, a specialist said. Its new owner has not yet been revealed. An extra lot of 15 identical jacket buttons, like the one which held the secret camera, which included an issuing slip from Soviet security agency the KGB sold for £130. Photography consultant and specialist Tim Goldsmith said: "We would of course like to say that the cameras were used by the KGB. But there's no way of proving that. What we can say is that an extra lot of jacket buttons included an original issuing slip from the KGB. "This is so that the person they were issued to could change all the buttons on their existing jacket to match the button with the camera in, so as to be more discreet." The cameras made more than £60,000 in total at the auction. The auction house's previous record sale was £18,200 for a 1970s Rolex Explorer Wristwatch.